West Nile virus (WNV) is an RNA virus that usually cycles between birds (like robins and crows) and mosquitoes. However, it can also cause fatal brain inflammation (encephalitis) when infecting humans. Related to Zika virus, Dengue virus, and Yellow Fever virus, WNV is responsible for some of the most extensive outbreaks of vector-borne disease ever observed. WNV in the Americas arose from a single strain that arrived in the United States in 1999, likely on a plane to New York from Israel or North Africa. Very early in the process of spreading through the hemisphere, a new genotype named WN02 arose via mutation, containing a nonsynonymous (amino acid-changing) difference in the envelope protein at site 159, changing a valine to an alanine. This single mutation greatly sped up WNV’s development in mosquitoes, shortening the time required for it to spread to new hosts — the unfortunate victims of the sick mosquito’s bite. This selective advantage led to the sweep of the WN02 strain across North America in a matter of a few years. As with other RNA viruses, mutations in WNV occur with high frequency. Despite this, WNV and its relatives often display less genetic diversity than other RNA viruses. Over a decade of lab research, mostly using chickens, has supported the hypothesis that this genetic constraint is due to natural selection acting differently in birds and mosquitoes. More specifically, it has been thought that WNV is relatively free to mutate in mosquitoes, where it gains genetic diversity. However, conditions inside birds are very strict, such that most of the virus’ diversity is pruned away. Furthermore, different mutations may be necessary to infect mosquitoes and birds, adding twice as many genetic requirements than if viruses infected only one host species. In a new paper in Virus Evolution, colleagues and I show that these models of WNV evolution, which were developed in the laboratory, do not seem to play out in the wild. The data come from over a decade of screening studies in which birds and mosquitoes in the Chicago suburbs were randomly caught and tested for infection with WNV. In the end, WNV infection was so rare in birds that only 6 birds could be identified as WNV-infected and also mapped to the same time and place as infected mosquitoes (which were more common). Instead of observing more viral genetic diversity in mosquitoes (as seen in the laboratory), we observed slightly more diversity in birds, with no significant differences between the two host types. Our results were surprising. Instead of observing more viral genetic diversity in mosquitoes (as seen in the laboratory), we observed slightly more diversity in birds, with no significant differences between the two host types. The host with the greatest amount of viral diversity was one of the birds, not one of the mosquitoes, and the infecting virus may have been undergoing positive (Darwinian) natural selection. When genetic variation existed in multiple hosts, it was nearly always the same variant — for example, a mutation from adenine (A) to guanine (G) — whether or not the host was a bird or a mosquito. And, perhaps most importantly, virus populations in birds were just as similar to viruses from mosquitoes as they were to viruses from other birds, on average. These results are important for a number of reasons. First, it seems that, while selection may favor certain genetic variants in birds and others in mosquitoes, this must be the exception and not the rule. Instead, when sites in the genome are allowed to vary, they can do so in either host type — in other words, there is no genetic signature of WNV in birds as opposed to WNV in mosquitoes. The virus is simply good at infecting both birds and mosquitoes — end of story. One consequence of this observation might be that only a small subset of all possible changes to the WNV genome represent viable options for WNV evolution. If correct, this substantially narrows the ‘candidate’ mutations that need to be explored in predicting how WNV and similar viruses will evolve next. Caveats abound. Because our study was of natural (not laboratory) infections, we were limited by the small number of captured hosts that were infected. Small samples are always subject to error. As a result, we were also unable to say anything about differences in how WNV behaves in different species of birds or different species of mosquitoes. However, our study does highlight the fact that the behavior of viruses in the wild does not always follow the expectations developed in the lab. 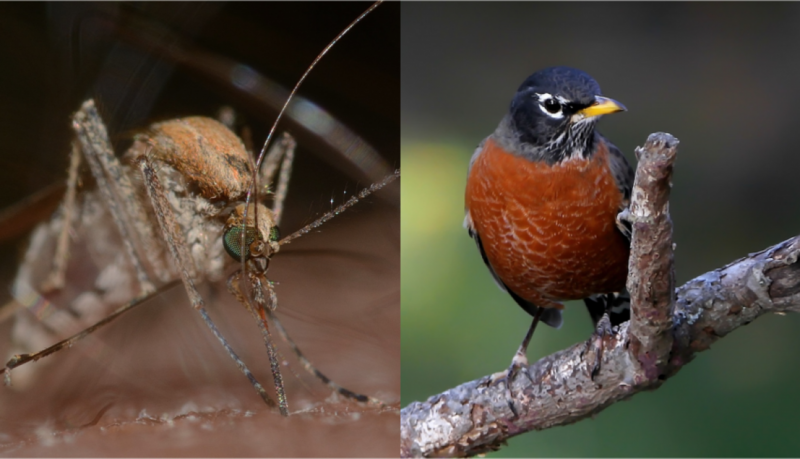 Most importantly, future studies should endeavor to use the same bird and mosquito species as those infected in the wild — for example, laboratory use of chickens to study WNV may not be as good a choice as, for example, robins. Deciding whether our results are generally true for WNV, or perhaps even for other related viruses, must await similar studies in other systems and regions.